A jet airliner en route from Athens to Washington is hijacked by terrorists. 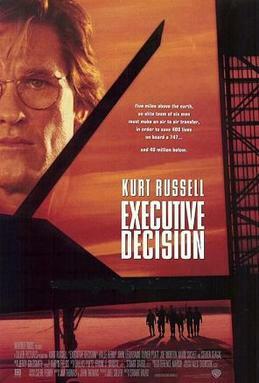 When it becomes clear that the terrorists’ demands are likely a cover for an attempted nerve gas attack, analyst Dr David Grant (Kurt Russell) reluctantly teams with special forces leader Lt Colonel Austin Travis (Steven Seagal) to board the plane in mid-flight and re-take control before it lands. A third and final Steven Seagal picture that I enjoy. If you look at Executive Decision on paper, it sounds relatively ordinary: a simple story of US soldiers versus Middle Eastern terrorists, shot in the confines of a passenger airliner and predicated on a fairly outlandish bit of speculative technology to get the soldiers onto the plane in the first place. It also sets up a very traditional sort of “enemies who must become allies” dynamic between the office-based analyst and the hardened field operative, played respectively by Russell and Seagal. It subverts all of that fairly quickly, in a manner that is best left for you to see for yourself – so if you’ve never seen Executive Decision it might be worth stopping at this sentence and coming back once you have. It all changes when, in complete defiance of genre conventions, Colonel Travis gets sucked out of an airlock and dies less than 40 minutes into the movie. The entire antagonistic set-up between him and Grant – over intelligence delivered before a failed mission – was effectively a ruse. The real crisis at the core of the film is one much more resonant of John McTiernan’s 1990 thriller The Hunt for Red October: how does an analyst cope when suddenly thrust into life-or-death field work? The results are hugely enjoyable, and in its second half Executive Decision is a much more interesting and effective film. The film ultimately works because it works with a boilerplate action-thriller storyline and fills it with distinctive characters played by properly decent actors. Even the villainous Nagi Hassan, easily the least developed of the leads, gets played by former Royal Shakespeare Company actor (and television Poirot) David Suchet. On the American side the film has been cast with the likes of Oliver Platt, John Leguizamo, Joe Morton and B.D. Wong. Each character is distinctive, and provided with enough hooks for their respective actors to get at least a few proper moments to stand out and show their stuff. Even Halle Berry, not an actor I usually appreciate, manages to develop her flight attendant character Jean into something a little more richly developed than you would normally see. In that respect it’s a film in the grand tradition of Jerry Bruckheimer: upping the quality of a B-grade movie by filling it with well-paid A-grade actors. It has worked for Bruckheimer many times, and it works here for rival blockbuster producer Joel Silver. Is it a cheat to claim this as a Steven Seagal movie? Almost certainly, but it was one hell of a surprise at the time. Early posters even included him opposite Kurt Russell, implying a film-long double act that we never got to see. What we got instead was almost certainly better. It’s a B-grade movie for certain, but within that context it’s a hell of a lot of fun.